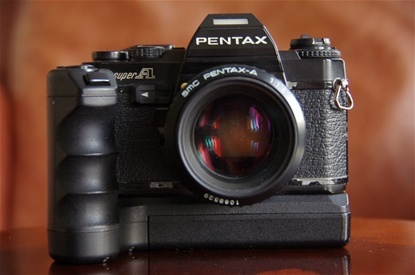 Pentax Super A from 1983. 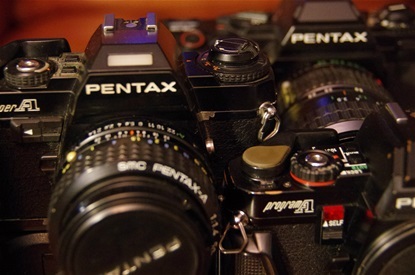 With the new Pentax A lenses it was a fully automatic camera. 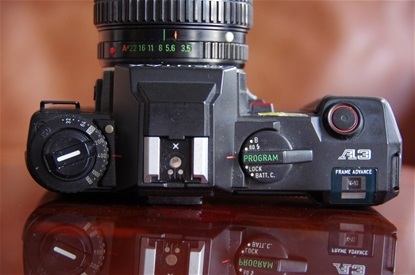 One could also choose semi automatic (Tv or Av) or fully manual settings. The top of the line in the A-series. 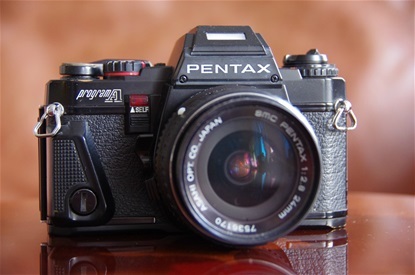 Awarded European Compact camera of the Year in 1984. In spite of all electronics built into it, it measured only 131x86,5x47,5 mm. Weight: 490 grams. Sn: 1592581. 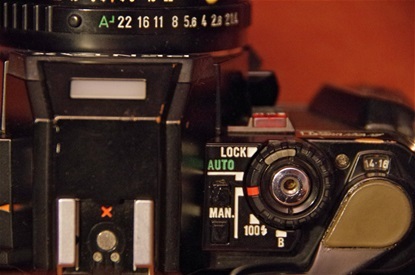 Lock, Auto (covering P,Tv and Av modes), Manual, Flash 125 and B were the options for the Mode dial. 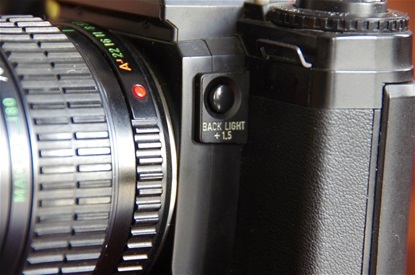 Push buttons to set shutter time to be seen in in a small window in the viewer, beside the over/under exposure window. 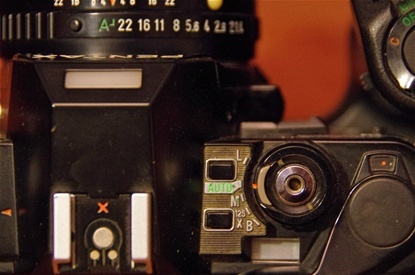 The Super Program was the first camera in the world with an external window. Program A. Produced one year after the Super A and less advanced an less expensive. Shutter time to 1/1000 instead of 1/2000, No Tv mode and no TTL flash metering. 131x86,5x47,5. 490 grams. Sn. 1392128. Controls very close to the Super A, but lacking the small window between the winder and the dial. 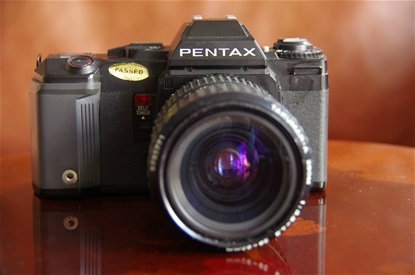 A3 from 1984 was introduced as a beginners camera with Pentax' first built in winder, DX coded and fully automatic. Size: 152,5X87,5X50,5. Sn: 3188807. 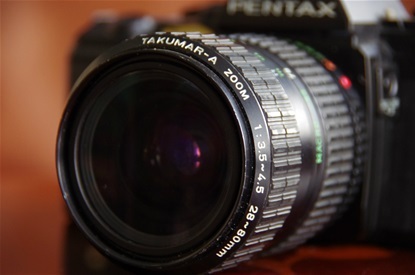 Lens here a Takumar A 28-80/3,5-4. Sn: 5731771. Simple and easy, though not the camera if you wanted to have control: Iso 32-1600, B-1/60 flash sync-automatic-off-battery control. Full battery dependance.